At the time of the opening it felt like a few things were left till the last minute, and we were all pushing to get things done on time. In the end, it all came together, and I'd like to call the night a success. We were able to sell a pretty good number of our books, and attracted a substantial crowd that night. Thanks to Brian, we've got a decent Flickr photo set for your enjoyment as well. Rated "G" showcases the artwork of Wendy Kowalski, Brian Sillman, Michael Webster, Jamin Belmont, myself, and the stories were written by Joel Finsel. More details about the project were previously mentioned here and here. The books turned out quite well I think (pictured above). 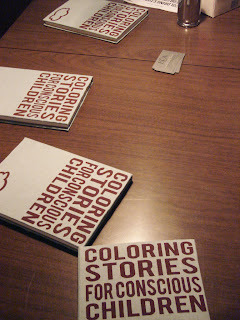 Again, they are limited edition hardcover coloring books, almost entirely hand-made by the artists. 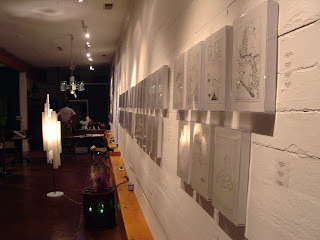 They feature a linen cover, silkscreen printed by Laura Venters, and all those who attended that night received copies signed by all the artists involved. In fact, a few signed copies still remain, but will be the last that include all of the signatures. It would appear that there has been very good press coverage for this event. Not only did we get a great article about the show in Encore by Lauren Hodges (pictured above, and linked), but we were even on the front of the Star News' Today section (pictured at left, linked). The column was written by Amanda Green, so thanks go out to her as well. In addition, Focus on the Coast will be publishing another article about this exhibit in their upcoming issue, and that piece will be written by Joel Fernando. For anyone who hasn't had a chance to see the show yet, its closing date has been extended till November 8. And if you're wondering where ERA Gallery is located, I'll make it real easy for you and provide this lovely little map. So if you want to know what all the buzz is about, now is your chance. I do believe it's a worthwhile endeavor, otherwise I would not be a part of it. Once you've seen it, feel free to comment on this post and tell us your thoughts!